MEMPHIS, Tenn. -- This was not the night to mess with Kevin Durant. Not if you were defending him, writing headlines about him or doubting him. Not even if you were the opposing ownership -- Durant barked back and forth at Memphis Grizzlies investor Steven Kaplan during a stoppage in play in the first half. This, of course, is exactly the demeanor a player of Durant's caliber is expected to display when facing an elimination game, as the Oklahoma City Thunder were Thursday. It would be assumed Durant would have to be dragged out of the playoffs fiercely against his will, not in the manner he'd slipped into over the past few games when he was inexplicably relegated to decoy duty in the fourth quarters. In the first nine minutes of Game 6, Durant got up eight shots and drew a shooting foul. That is what the Most Valuable Player does. He and the Thunder were rewarded for his aggression as he played his most complete game of this series and scored 36 smooth points in the Thunder's 104-84 victory to even the series at 3-3. "I just told myself I don't care if [shots] go in or not," Durant said. "I just tried to focus on the defensive end and inspire my team and spark us." Joe Murphy/NBAE/Getty Images Kevin Durant (36 points, 10 rebounds) wouldn't be denied in Game 6. Durant was fine on the defensive end, and overall the Thunder's early energy went unmatched by the home team, an oddity considering the stakes of the game. Then maybe it should've been expected since the road team is 4-2 in this series and has taken the past three games. 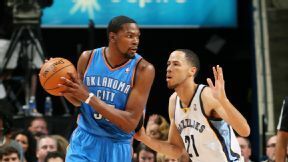 Durant's individual strategy was evident from the outset. He was not going to allow his teammates, or the Grizzlies schemes, to dictate how this game was going to unfold. And he was not going to settle for the little space the Grizzlies were allowing, and he repeatedly drove the lane and earned free throws, 15 of them in all. He made 14, the same number he'd attempted in the past two games combined. "Durant ate first tonight," Grizzlies coach Dave Joerger said. "Sometimes he tries to get other people involved. I thought he was very assertive earlier in the game. ... I don't know that there was a lot of X's and O's, I really don't. He came to play with a lot of force." There was a lot of bad news for the Grizzlies. Their series-long ideal of getting Durant to lull into a passive mode was blunted from the start, as Durant took his team's first three shots and was on his way to the fourth when he turned it over. Before Joerger could even get his Durant stopper, Tony Allen, into the game, Durant was already in double figures. Then, in the second half as the game was getting out of control -- the streak of four consecutive overtime games came to a heavy thud -- the Grizzlies suffered a potentially severe blow when point guard Mike Conley tweaked his right hamstring as he pulled up lame on a fast break. After a visit to the locker room, he returned but didn't last and was pulled again. His status for Saturday's Game 7 is now in doubt. The Grizzlies termed it a "mild" hamstring pull, but that is an injury for which there's no such thing as mild. Not only is Conley a vital part of the Grizzlies offense -- his 2-of-10 shooting for just five points was a major reason his team turned in its worst offensive game in the series -- but Memphis is thin at his position. Regular backup Nick Calathes has been suspended for the series, and fill-in Beno Udrih has lost his magic from the first few games. He went just 1-of-8 shooting in Game 6 and struggled defensively. Memphis got decent production from big men Marc Gasol and Zach Randolph, as they combined for 33 points. But this is a team that doesn't have any margin for error offensively, and with Conley off and then hurt, the Grizzlies suffered badly. Courtney Lee is mired in a slump, now 10-of-34 over the past four games, and Mike Miller didn't get the 3-point looks he was accustomed to. The Grizzlies could be down to Udrih as their only point guard in the most important game of the season, and the Thunder demonstrated what that could portend as they dominated the point guard battle Thursday. After being out of control at times over the past several games by taking some wild attempts early in the shot clock, Russell Westbrook played with tempered aggression throughout the game, actually allowing plays to develop, screens to be set and higher-percentage shots to be found. Westbrook in semi-manic mode and Durant in tiger mode is the sort of homeostasis the Thunder are designed to achieve. Westbrook put in 25 points on 21 shots, and Durant's 36 on 23 shots was a world of difference from their unbalanced efforts of the past four games. "We did a great job of just being calm, coming in and being cool," Westbrook said. "Our job was to come back and stay together." Overall, Thunder coach Scott Brooks assembled a solid game plan with some tweaks that worked. He took Thabo Sefolosha out of the starting lineup and replaced him with Caron Butler, a move aimed at getting more offense on the floor and to create a matchup issue with the Grizzlies at other end. Brooks also expanded his use of a smaller lineup to deploy more scoring punch. The result was the Thunder cracking 100 points in regulation for the first time since Game 1 and shooting 49 percent after they shot under 40 percent in the first five games. Those effective maneuvers plus Durant's urgency were the reasons the Thunder won, though the story of the headline in the Oklahoman newspaper was a juicy one. The paper declared Durant as "Mr. Unreliable" in Thursday's editions because of his recent substandard play, a move that kicked off a furor in normally Thunder-happy Oklahoma City. The paper ended up apologizing for going too far, and normally ultra-reserved and publicly silent general manager Sam Presti fired off a statement pointing out how reliable Durant was when he donated $1 million to Oklahoma tornado victims last year. Comparing basketball production to humanitarianism was an odd jump for Presti, but it probably scored him some points with Durant and his family, who were outraged, and that was surely the mission. Whether any of that truly mattered to Durant is for him to know, and he's not disclosing it out for now. Whatever he did to get his mind ready for this vital game worked, and his performance was truly the delivery his team and his short-term reputation badly needed. "We were down 3-2 and on the brink of elimination, that's motivation enough," Durant said. "Headlines, I'm not going to give them credit for nothing." MVP: Kevin Durant. So much for Mr. Unreliable, huh? KD was his normal dominant self, struggling from 3-point range but otherwise precise, recording 36 points and 10 rebounds. He was hot from the get-go and never cooled off. X factor: Russell Westbrook. The other half of the Thunder's dynamic duo was also back to his normal form. His shot wasn't falling (he shot just 9-of-21 overall), but he played with much better control than previously in the series. LVP: Courtney Lee. Memphis' starting five is in desperate need of outside shooting, which is exactly what Lee is supposed to provide. Thursday night, in just 22 minutes of action, Lee was ineffective, shooting just 2-for-7 overall and 0-for-2 from deep. MVP: Draymond Green. The second-year former Spartan was Golden State's everything. Green guarded 1 through 5, was a major factor in the terrible shooting night of the Clippers' two superstars and matched DeAndre Jordan's ferocity on the glass all while putting in a healthy 14 points. Draymond Green is basketball. X factor: Fouls. Fouls! FOULS! Key players for both teams were plagued with foul trouble throughout the evening, with Blake Griffin, J.J. Redick and David Lee all fouling out and Chris Paul, Draymond Green and DeAndre Jordan all flirting with disqualification. It's tough to know whether the poor shooting came at the expense of the multitudes of whistles, or if the players were forcing the contact because of poor offensive nights. Either way, it was tough to watch. That was ... a brick house: Two teams that featured so many dynamic and skilled offensive players built a sturdy home with all the missed shots in Oakland; Golden State and L.A. going a combined 67-for-176, 38 percent. Even the Warriors' free throw shooting was atrocious, a full 13.1 percent below their season average. Sometimes the basket is an ocean. Tonight it was a thimble. MVP: David West, who finally gave Paul George the complement that the Pacers needed. West's huge game involved 22 points -- 12 in the fourth quarter -- 11 rebounds, 6 assists and 2 steals. Defining moment: With 34 seconds left and the Pacers up two, Hawks guard Lou Williams drove into the lane and then threw the ball directly to George. Williams then compounded the mistake by immediately fouling, giving the Pacers a two-possession advantage after the two free throws. That was ... critical: As much as the Pacers have been criticized during the past two weeks, they now have the deciding Game 7 in their building on Saturday. The Hawks are 0-8 all time in Game 7s on the road. Kevin Durant, Thunder: Thanks to KD's 36-point, 10-rebound performance in Game 6, the Thunder will head home for a Game 7 showdown against the Grizzlies. Roy Hibbert, Pacers: Hibbert logged just 12 minutes in the Pacers' 95-88 win in Game 6, going 0-for-1 with zero points and four fouls. Don't expect his stat line to change much -- the Pacers went small in Atlanta -- as the series heads back to Indy for Game 7. Looking like pressure is going to be on the Memphis Commercial-Appeal to insult 1 or more Grizzlies the morning of G7. "I told the guys, 'If worse comes to worse, we've got to play park basketball.'" -- Pacers forward David West, on Indiana's fourth-quarter comeback in Game 6. 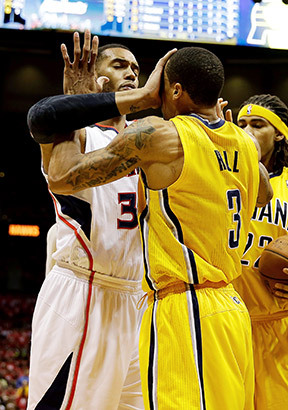 Mike Zarrilli/Getty Images Mike Scott and George Hill got into a scuffle in Atlanta on Thursday night. Hill and the Pacers got the final word, forcing Game 7 with a win. Roy Hibbert's last basket in the series came at 5:09 of the second quarter in Game 4. He has now been held scoreless in his past 125 minutes, 9 seconds of game time.